The roads linking the three northern provinces of Ha Giang, Cao Bang and Bac Kan travel through some of the most spectacular and remote regions of Vietnam. The landscape around here is extraordinary: many travellers consider this their favourite place in Southeast Asia. Connecting two of the most scenic motorbike routes in the country (the Extreme North Loop and the Northeast Loop), a handful of incredible mountain roads corkscrew their way through a complex terrain of steep valleys, limestone karsts, and raging rivers. There are several different route options for riding between Ha Giang, Ba Be Lake (in Bac Kan Province), and Cao Bang; all of which are stunning, but none of which are particularly straightforward. In this guide, I’ve mapped three routes that connect the extreme north with the northeast. 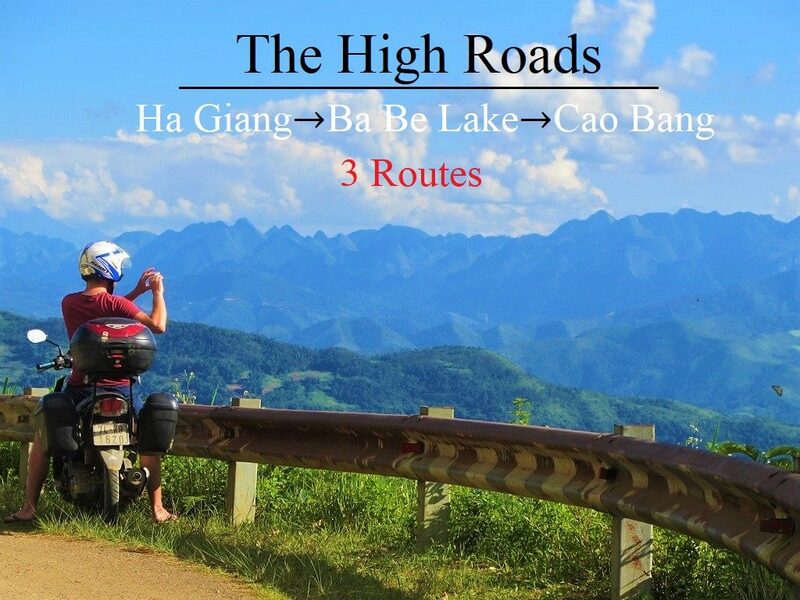 The map below shows three alternative routes between Ha Giang, Ba Be Lake, and Cao Bang. The Classic Route (the blue line) is the most popular and easiest to follow; the Border Route (the red line) is the most remote and least travelled; and the Ba Be Lake Route (the green line) is a combination of rarely used roads and national highways. The purple lines are connecting roads between the three routes, so you can mix and match as you please to create a route that suits you best. Although all of these routes are extremely scenic, they’re not necessarily easy to ride. The difficult, mountainous terrain, and frequent bad weather, mean that road conditions often deteriorate, resulting in treacherously muddy sections. What’s more, roadworks to upgrade and maintain these routes are ongoing. I’ve marked sections of rough road as best I can on my map. But, when riding any of these routes, take note of recent weather conditions (heavy rain, for example, can lead to serious landslides which can block roads for hours or even days), and try to ask locals or other riders you meet about current road conditions. Below, I’ve written a brief description of each route. For accommodation, there’s at least one mini-hotel or local guest house (nhà nghỉ) at each of the places marked with a red pin on my map. (For more details about accommodation in Ha Giang and Cao Bang see my Extreme North and Northeast guides.) Any time of year is good, but the heaviest rains occur during the summer months (June-August), and it can be bitterly cold during the winter months (December-February). Although any of these routes can be completed in one (long) day, the winding roads make riding a lot slower than you might expect. Alternatively, you can turn this into a scenic round trip by connecting the upper, lower, and middle routes and making a loop. Starting out on the famous Ha Giang Extreme North Loop via the limestone landscapes of the Dong Van Karst Plateau, the Classic Route then heads southeast from Meo Vac on road QL4C down to the Gam River Valley. Out of Meo Vac there are some fabulous views over a vast and sparsely populated landscape. Although mostly upgraded, parts of the southern half of QL4C to the Ly Bon intersection with QL34 are still undergoing repairs. However, these should be finished by the time you read this. After crossing the bridge at Ly Bon, turn onto QL34 due east towards Bao Lac. Ly Bon is at the confluence of the Nho Que and Gam rivers, and the ride to Bao Lac affords some picturesque views of riverine scenes. Bao Lac has plenty of guest houses if you need them. From Bao Lac, continue southeast all the way to Cao Bang city, via the mining town of Tinh Tuc and Nguyen Binh (both of which have a couple of nhà nghỉ guest houses). It’s a long ride to Cao Bang, and, although the scenery is superb (particularly around Tinh Tuc), the road conditions to Nguyen Binh are unpredictable. Expect a few rough patches, potholes and, if there’s been rain, landslides. Between Tinh Tuc and Nguyen Binh, there’s an intersection with a turning due south on road DT212 to Cho Ra: use this excellent back-road if you want to go to Ba Be Lake. 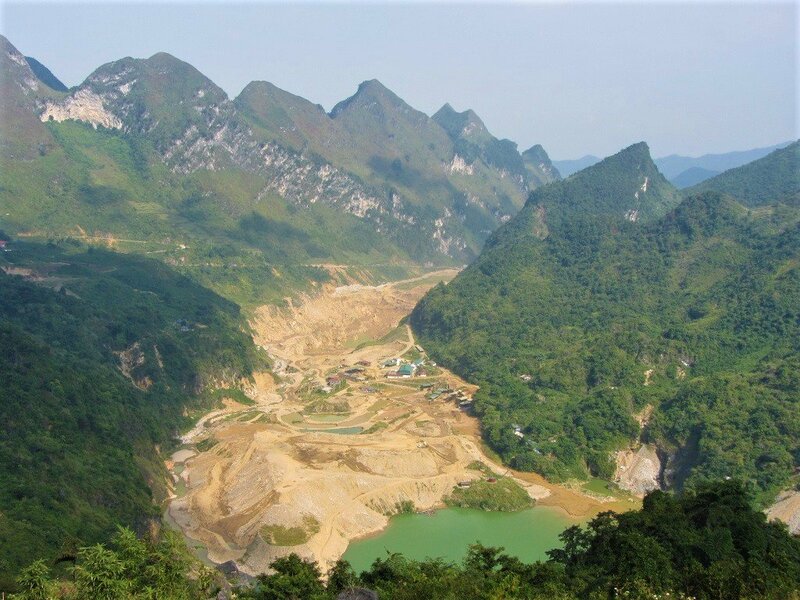 If not, continue east along the meandering QL34 to Cao Bang City. After following the Extreme North Loop from Ha Giang to Meo Vac, head southeast on road DT217 towards the famous ‘Love Market’ of Khau Vai (usually held in April). This meandering road soars over a limestone plateau before descending sharply through Khau Vai village and down to the banks of the Nho Que River. Road conditions deteriorate severely before crossing the river and continuing the other side. From here, it’s a twisting ride over barren mountains (with incredible views) all the way down to Bao Lac in the Gam River Valley. The road surface is very inconsistent on this section, and it may prove challenging for riders on automatic motorbikes. Bao Lac has a few local guest houses if you need to stay the night. Follow the Gam River east of Bao Lac on an as yet unnamed road. This road is currently the talk of many riders in Vietnam. Hugging the Chinese border for much of its length, the road passes through some extremely remote landscapes. As if the fabulous scenery weren’t enough, the road itself is quite a sight. A narrow asphalt lane, it’s full of contortions and knots; constantly switching back on itself as it negotiates the difficult terrain. Just look at it on the map: it looks like the path of an agitated dragon, shifting violently from left to right, as if trying to shrug an assailant off its back. One pass in particular is breathtaking: Ascending what is essentially a vertical wall of rock, the road passes 14 (by my count) consecutive switchbacks. I call this the ‘Roller Coaster Pass‘, although it has recently been named đèo Mẻ Pia on Google Maps. And while we’re randomly namely things, let’s call this unnamed road the ‘Agitated Dragon’. And so, the Agitated Dragon continues east along the Chinese border (with some extended rough, gravelly sections in the middle) until it hits the Ho Chi Minh Road (DT208), just south of Pac Bo Cave. (To visit the cave – which is well worth it – turn due north on road DT208 for 10km). Turn onto the Ho Chi Minh Road (DT208) and ride its smooth course south for 40km to Cao Bang city. This southerly route between Ha Giang and Cao Bang, via Ba Be Lake, can be joined at any point along road QL34: you don’t necessarily have to begin it on QL34 right out of Ha Giang city (see the purple lines on my map for connecting roads with the green Ba Ba Lake route). This route comes in two halves: the first half passes through lovely landscape but there are a fair few rough road sections; the second half, from Ba Be to Cao Bang, is generally a very smooth ride. Take QL34 east out of Ha Giang along the very pretty Gam River Valley. Unfortunately, this section of road has been in poor condition for years. Expect to have to deal with giant potholes and muddy patches. It might be slow going but eventually you’ll reach the intersection with road DT176 heading south to Da Vi. This is an isolated, beautiful road: a narrow paved lane slicing along valleys and over mountains. It’s a gorgeous ride in good weather, but again you will have to contend with some pretty awful road conditions. In dry weather it should be OK, but if there’s been heavy rain it’s likely to cause landslides and mud pools. Take a look at the photo below to get an idea of what I’m talking about. Having said that, the bad patches are short (but difficult), and if you have a decent bike, it shouldn’t be any problem. DT176 ends at the small village of Da Vi, on the edge of a giant reservoir. It’s a very off the beaten path place, but there’s a nhà nghỉ guest house here if you need it. From here, bear east onto an unnamed road leading over some spectacular mountains and through dense jungle all the way to the crossroads near Ba Be Lake. To go to the lake and the homestays on its southern shores, turn due west. Otherwise, take road QL279 east towards Cho Ra village, where there are several guest houses. From Cho Ra, it’s a lovely, lush ride to the intersection with QL3 at Na Phac. 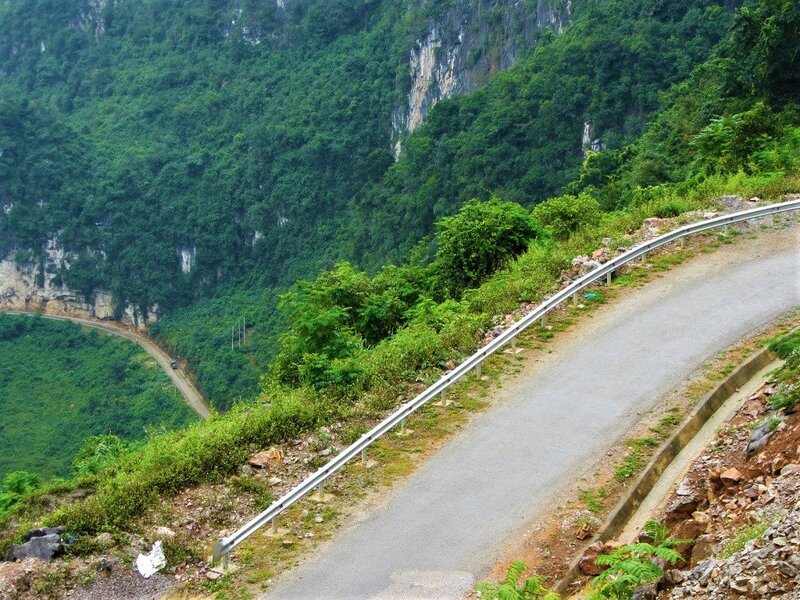 National Highway QL3 is a great road ploughing through marvellous scenery all the way to Cao Bang city. 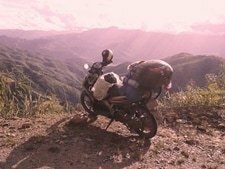 This entry was posted in ALL, Ha Giang Motorbike Routes, MOTORBIKE GUIDES, Mountains, The North and tagged Ba Be Lake, ban gioc, Bao Lac, cao bang, China border, ha giang, meo vac, motorbike, Pac Bo Cave, QL34. Bookmark the permalink. Hi we are planning the DT197C on our way to Sapa, has anyone had any experience with this road lately? I do see some uploaded pictures along the route on Google maps. As far as I know it’s at least partially off-road, so if you have off-road experience and a bike that can handle it you can take your chances, but if not, it’s better to stay on DT177/178 instead. If you do take DT197C please report back on the road conditions. I LOVE your site. Amazing Guides. I am currently planning a route that starts in Ha Giang and ends at Ba Be Lake. 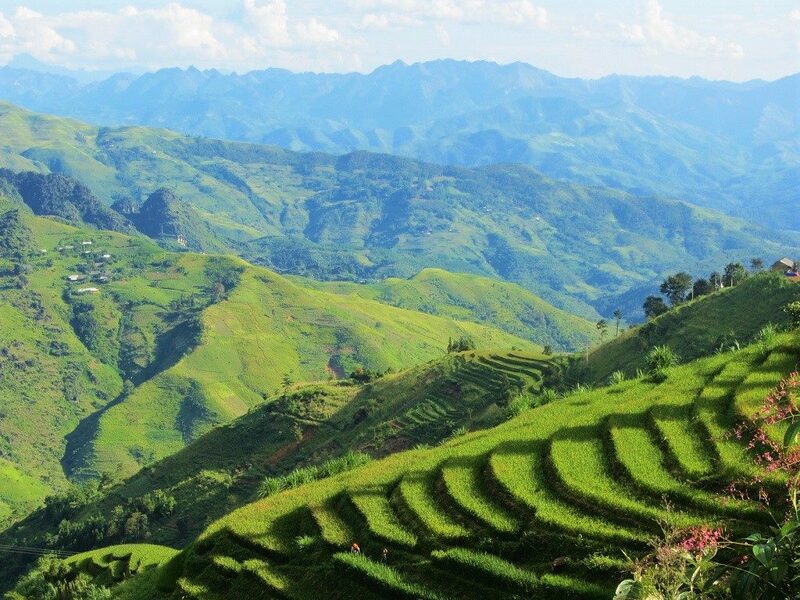 I want to experience as much of the Ha Giang Loop as possible. That being said. Have you ever taken DT176 south of QL34? If so, do you know the road conditions? That road is part of the Green Route in the guide on this page – please read the description of the Green Route for more details. 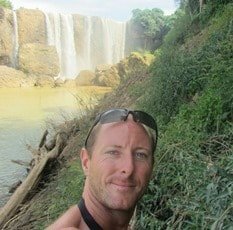 I am doing a trip with my son to northern vietnam on a motorbike and was hoping for some advice. We are planning the trip ourselves and we plan on doing it on our own and not on a guided tour. We are wanting to include these places below in the trip, can you tell us the best and most logical route to take to incorporate these paces in our trip. I understand a couple of them are slightly out of the way (waterfall, Sapa) but we will plan it it accordingly. If there is anything amazing that I missing out on that is close to these towns, please let me know so I can include them. There will be 2 of us on the bike with a 1 large or 2 small packs, can you suggest a good bike to use, we obviously want something suitable with a bit of power for the mountainous terrain so a 110cc scooter is probably not going to cut it. Can you suggest something in the 150-250cc range that is reliable, with a decent storage rack on the back for our gear, and will go off-road if you want to explore some dirt tracks etc. I have only really looked at the Honda XR150 so far. An XR150 is good for that route. There are a couple of other similar bikes available too – you can find out more about those by checking out the websites and contacting the rental companies which I recommend on this page: they are all reliable services with good quality bikes. Also, if you’re intending to start your road trip from Ha Giang, QT Motorbikes are excellent. Your route is fine, but perhaps you should consider starting in Sapa, rather than leaving it to the end: that way you will be going from west to east along the northern mountains. Most of the rental companies should be able to arrange to ship your bike from Hanoi to Lao Cai (Sapa) by train – you can also travel to Sapa by train: see this guide. Otherwise, it’s a very long way from Cao Bang to Sapa. If you do that you can follow my route guides from west to east in this order: Sapa to Ha Giang | Ha Giang Loop | High Roads to Ba Be Lake & Cao Bang | then take QL3 to Ban Gioc Waterfall. 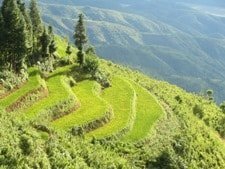 Alternatively, follow the same route, but start in Ha Giang with the Ha Giang Loop and skip Sapa altogether. Thanks for that great info. I think I will do the train from Hanoi to Lao Cai instead and do sapa, makes more sense as you pointed out. What are the best months to do this if I want to avoid lots of rain and bad weather? I may have some questions in the coming weeks if thats ok? For my motorbike rental recommendations in Hanoi see this page. If you have a few days, the Sapa-Sin Ho Loop is perfect. Yes, you can send your bike on the same train and you are on when you take the train between Hanoi and Lao Cai. My favourite months for riding in the north are March-May and September-October. 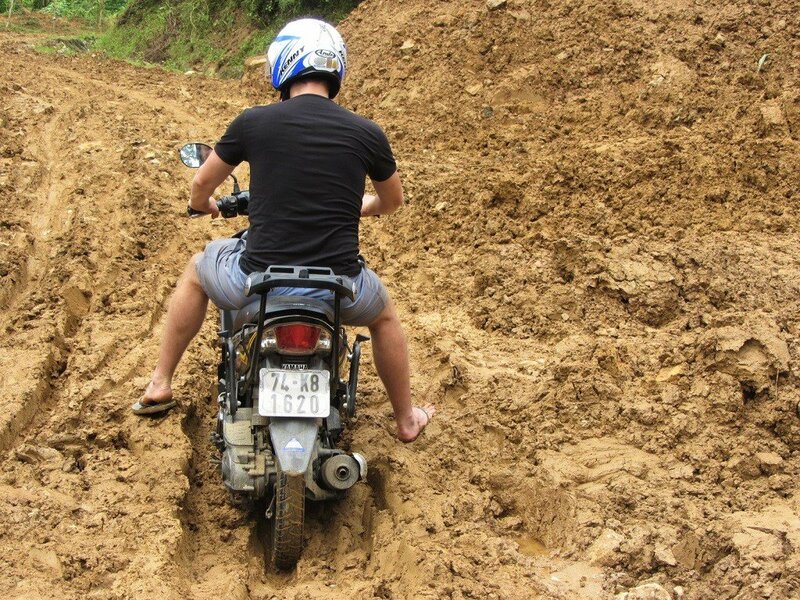 If was going to to this route but the other way around (Cao Bang → Ba Be Lake → Ha Giang) I am after some adventure and we love the dirt tracks and mud. I will check weather reports and road conditions prior to going but which route would be the best option for us, if we want to take some tougher dirt tracks like DT176. I know its hard as each route probably has its good points and awesome scenery. Hi Tom, thanks a million for the quick reply, I will focus on the red route. So my girlfriend and I have been motorbiking through Cambodia and Vietnam for the last few weeks, starting in Phnom Penh, making it now to Ba Be Lake. Our next plan is to go from our guesthouse here at Ba Be to Ha Giang, potentially taking the route going to Da Vi onto the DT176 to QL34. I have dealt with rough patches before and it hasn’t been too much of an issue. We are two people with two big bags and one very reliable Honda Detech, it has been a little rainy over the last couple of days so I’m not sure what I’m getting myself into here going along this route. If you could give me some advice or some more information on what these roads are going to be like this time of year, that would be really appreciated! Also we haven’t been able to find the guesthouse in Da Vi online at all, do you know how we could find it on a map? We have also thought of breaking up the trip into two days. It’s very difficult to say how the road conditions will be, because they can potentially change at any time – if there’s been a landslide or construction etc. But when I was last on that route, there were two short (a few hundred metres) very muddy sections, as well as a couple of recently cleared landslides. But a Detech should be pretty good at handling such conditions. The guest house in Da Vi is called Hoang Dinh (0972 992 144) – it’s a very small village and we only found that one guest house there, but it was fine. Thank you so much the coracle has been amazing for our whole trip really appreciate the work!! Thanks, Nick. I’m glad to hear that. Good luck on the next leg of your road trip. Superb webpage so big BRAVO to you. I am renting an XR150 in Hanoi on Sunday 30th March and planning to ride Sunday to Friday. Would you be able to suggest a itinerary which will cover the best of the area please? I am not sure the Hanoi to Ha Giang ride on Day 1 is ideal, 300 km seem quite a distance in one day so could it be broken up with a stop in between? Yes, that is quite a long ride for one day, but it is possible if you have experience riding in Vietnam and if you start early in the morning. 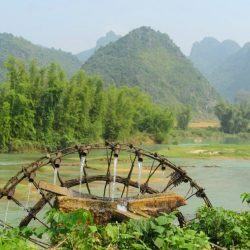 However, it’s much nicer to break the ride between Hanoi and Ha Giang with a stop at Thac Ba Lake – see this guide for more details. What time of year would say offers the warmest, driest weather up there? April-May is probably your best bet. September-October is also good, but there’s always the chance of tropical storms coming in then, too. At the beginning of your travelguide you mention that since October 31st you should have a Vietnamese or International drivers license to do the loop. Do you have any additional information about this? (How strictly does the police check this? What is the consequence not having an IDL when checked?) We will buy our semi automatics in Hanoi. Will they take the motorbike if we are doing the loop and dont have an IDL. One of us does have an IDL the other doesnt. Would you recommend doing the loop on one motorbike with two persons? We really like to hear from you soon! All the reports are that the law for licenses in Ha Giang Province is being taken very seriously. There are some police check points that you can’t avoid, and if you don’t have a license your bike may be impounded. Some riders manage to avoid the check points by leaving before 5.30am, but in my opinion it is not worth the risk. 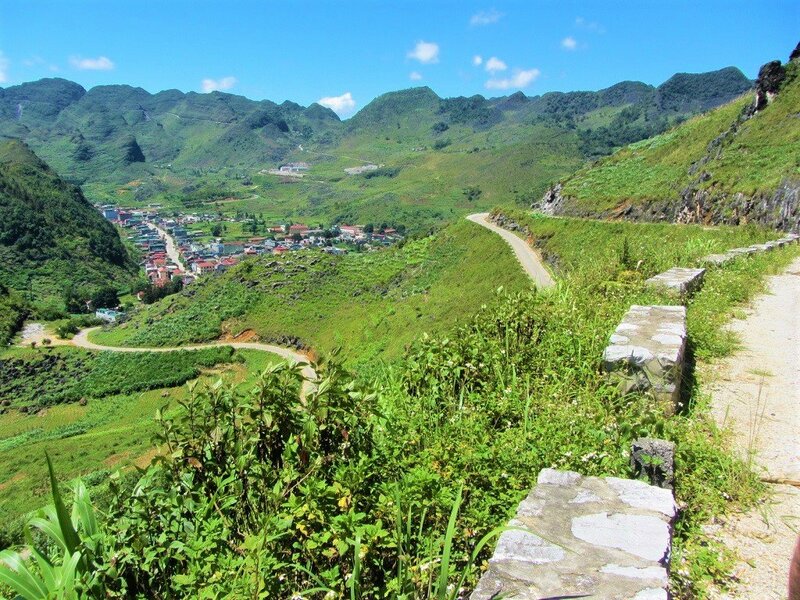 If one of you is licensed, riding the Ha Giang Loop two on a bike is fine, as long as the bike is in good condition – it needs to be, because of all the steep climbs and hill starts. I’ve just came back from an amazing month in this amazing country. 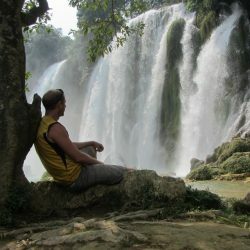 During the first 8 days I’ve done, from Hanoi, all the Borders&Back-Roads, The High Roads itinerary and then back to Hanoi. It was one of the best experience I’ve ever had and I don’t think it would have been possible without this blog. Great to hear you enjoyed these routes. I agree – it’s an amazing region. Thank you for your kind words and for your generous donation to my site. 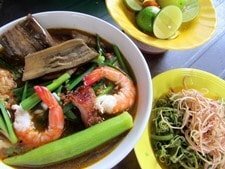 I’m planning the red boarder route on a bicycle tour as part of a trip through southeast Asia, I used a lot of your posts to guide me through Vietnam on a moped last year and can’t wait to be back. I’ve got no issues covering 100-230km a day depending on the quality of the roads (which is heavily dependant on the weather). Are there any parts where I’ll really struggle for accommodation , I’m not taking sleeping gear so I need to plan slightly better this time. I’m planning to head all the way south on the Ho Chi Minh Road, I know there’s a few parts where I might have issues finding somewhere to sleep but any tips on where i need to research extra would be appreciated. For the Ho Chi Minh Road, see my full guide here, which includes accommodation. 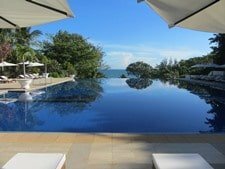 The part you need to plan in terms of places to stay is the Western Ho Chi Minh Road – see Section 5 of that guide. On the border route (the red line) you will need to complete the sections between Meo Vac and Bao Lac, and Bao Lac and Pac Bo, each in one day, because there’s little (or no) accommodation between those places on the border route. However, if you really do get stuck you can always find a bed in a local home. On a bicycle on this terrain it’s very unlikely you’ll complete up to 230km per day – even on a motorbike that takes a long time in these mountainous provinces. Thanks for the reply, have you had any more feedback on the 197C? I might attempt that 60km stretch so I’ll let you know how it goes. I don’t think I’ve heard anything new. Please do let me know if you ride it. Hi Tom, after a trip last year doing the Classic loop (Ha Giang – Quan Ba – Meo Vac – Du Gia – HG), going back in a few weeks with a friend and want to do something new. Your articles are exceptionally helpful, as always. Thinking of going to Bao Lac after Meo Vac. You say DT 217 after Khau Vai is very treacherous. Would you recommend sticking to QL4C on semi-autos ? DT 217 is too difficult to ride without dirt bikes ? From Bao Lac, will go to Du Gia and then back to HG. Thanks for all the help and for the blog ! I’ll update in a few weeks with road conditions. Yes, personally I would avoid DT217 if you’re not of a bike that can handle off road, because the middle section is too rough, especially if it’s been raining. However, if it’s been particularly dry, you could get through on semi-autos. But in general, I’d stick to QL4C for now, which is still a fantastic ride. You should also bear in mind that the southern section of road DT176 connecting QL34 with Du Gia is usually very bad, too. Check my Ha Giang Loop Guide, which now includes lots of updates (since last year) and side routes (including Du Gia) and information about rough roads. Again, it’s all about the weather, really: if it’s been dry then you should be able to get through; if wet, it’s going to be tough. Thanks Tom, always very helpful. Yes, the south of DT176 and the end of QL34 were terrible and slippery last year. Will probably go up through Du Gia and then slowly go through the rough DT181. If everything is dry, might try DT217 but don’t want to have to turn back in Khau Vai. Will let you know how all roads are looking soon. Just wanted to say thanks for such a detailed and well set out blog. Im doing this loop in a few weeks on a Honda XR150. Did you find it necessary to book any of the accomdation in advance or should it be okay to just turn up and try my luck? I’m allowing 7 days for some side trips , undecided on whether to explore more of the north west or the north east. Should be really good fun on an XR – I don’t think it matters which direction you choose, the XR will be able to handle it and the scenery is great in all directions. On these particular routes I don’t think you need to book in advance, unless you want to stay in certain popular homestays in Ba Be Lake, especially on weekends. I hope you have a great trip. Is there a place where we can rent motorbikes in Cao Bang Town. As we are considering going from Hanoi direct to Cao Bang . 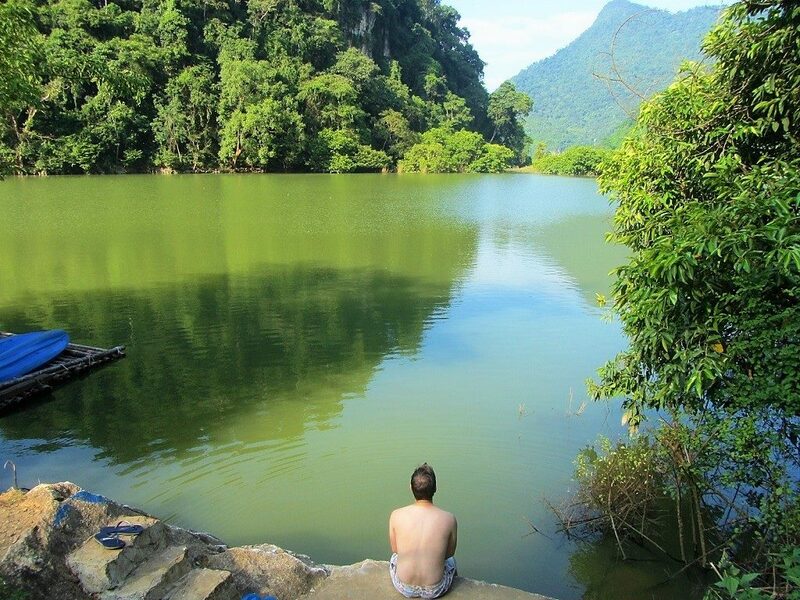 Then from Cao Bang do the Ban Gioc Loop . Many of the hotels/guest houses in Cao Bang can arrange bike rental, but I can’t recommend any specific place. QT Motorbikes (based in Ha Giang) were thinking about opening a shop in Cao Bang, but I’m not sure if they have yet. Hi Tom, Myself and a couple of friends are planning on riding one or more of these routes during the first couple of weeks in August. I know there have been some heavy rains in the North and I am wondering what the roads are like at the moment. Is there any way for a non-Vietnamese speaker to find out? Also, I’m having trouble viewing your maps. Is it my connection, I’m outside of VN at the moment, or a known issue? Thanks for taking the time to write this blog in such extensive detail. It’s interesting reading and incredibly informative. Cheers! There isn’t really any way of knowing for sure – just asking other riders, and perhaps some of the motorbike rental companies, because they get reports back from customers who’ve recently ridden those routes. You could contact QT Motorbikes in Ha Giang, for example, and they are also a very good place to rent from in that area. Oh, and the maps problem must either be your browser or device – all my maps are ‘public’ so you should be able to view them easily. Rented a car and driver for two weeks in the northern mountains. Did this exact same segment. Most enjoyable and beautiful ride. Spent two nights in a Babe homestay. Can’t recommend enough. Cheers! Good to hear that. Yes, I agree, it is certainly a wonderful part of the country. I’m thinking of doing the same. How much does it cost to rent a car and driver for 2 weeks? Thanks. It’s usually around $80-$100 a day to hire a car and driver (including the driver’s food and accommodation). Your blog is a wealth of information, I’ll be relying on it extensively to prepare for my trip to Vietnam next year. Thanks for all the awesome work! Thanks, great to hear that. I hope the planning and the actual trip goes well. Hope you’re well. How many days riding would you suggest for the border route? I see you say its 370km so want to plan where to stay overnight. Any specific places you would suggest for accommodation? It depends where you start. If you start from Ha Giang and want to take the border route (via Meo Vac, Bao Lac and Pac Bo) all the way to Cao Bang then you’ll need at least 2 days. 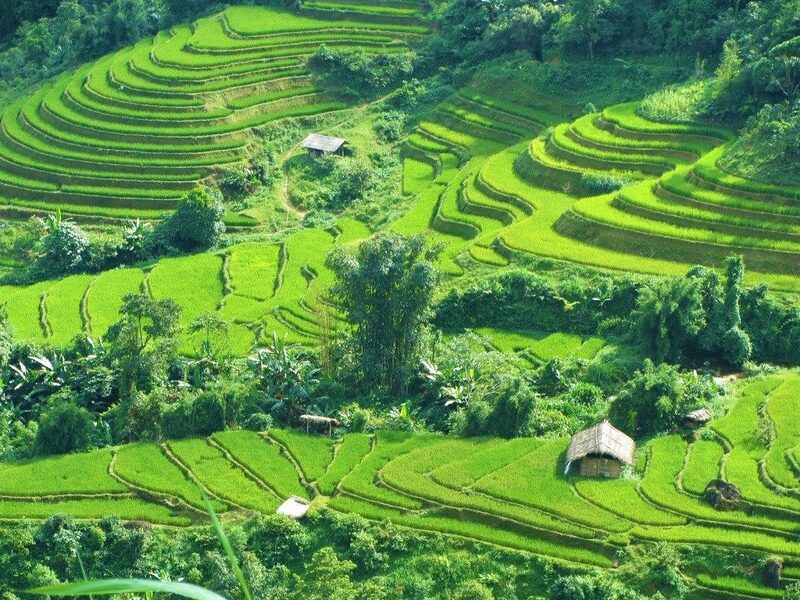 For example, Day 1: Ha Giang-Yen Minh-Meo Vac; Day 2: Meo Vac-Bao Lac-Pac Bo-Cao Bang. However, 3-4 days would be much more comfortable and leisurely. 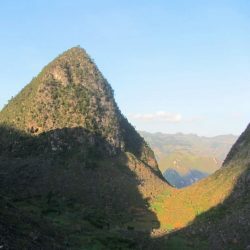 You can find accommodation in all the towns on the Ha Giang Loop (check the relevant sections of this guide for my recommendations of accommodation in each place), from Ha Giang through to Dong Van, Meo Vac and Bao Lac. Between Bao Lac and Pac Bo there’s hardly anything, but there are a couple of guest houses near Pac Bo. 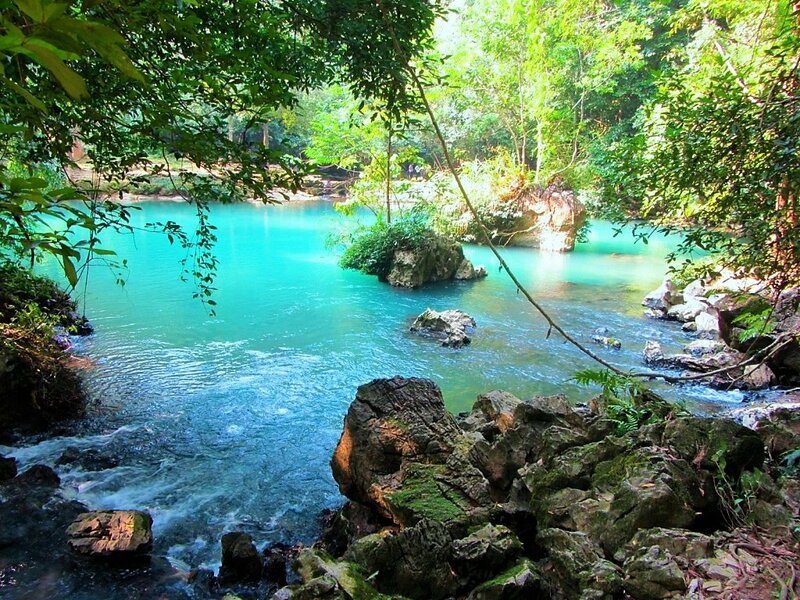 The nearest decent accommodation is in Cao Bang. Thanks Tom. Appreciate your assistance. Have you taken DT 197C from TT Vinh Quang to Thanh Thuy on QL2 (running along Chinese border) and then to Ha Giang? Last year I took QL 4D to Muong Khuong and continued to Hoang Su Phi as you recommended. At Hoang Su Phi I am wandering if I should take DT197C to Ha Giang, but then I chicken out, and chose the safer road of DT177 to QL2 and on to Ha Giang. Your infos are really helpful. I tried DT197C once, a couple of years ago, but it was in bad condition and local authorities didn’t like me being there. However, it might have changed by now – both the road quality and the authorities. Although I think one reader tried it about 6 months-1 year ago and said he had to stop because of bad conditions. Let me know if you do decide to try it – I’m sure it would be a really scenic road. We tried 197c yesterday leaving from Vinh Quang end but got lost because Google Maps kept dropping out near Then Chu Pin. A couple of people we met did it on XRs coming from Ha Giang so it is possible. I would not recommend the road for those on scooters or the inexperienced. There are sections where the track requires you to ride right on the edge with big drop offs. Thanks for sharing your experience of Road 197C. Just to be clear for other readers, this comment refers more to Hoang Su Phi section of this route, rather than the routes above on this page. Wow! I checked your website today (currently in Quang Uyen) in order to plan my next route, and I see that you have updated it with yet another route! I took the ‘agitated dragon’ road two days ago and was in awe at the section in which you have mentioned. So much so, that I shared it on Facebook with the Google Maps terrain that shows the 14 switchbacks. And what about that view from the other side? Wow! It has to be one of my favourites so far! I also took the DT217 Road from Meo Vac all the way to Bao Lac and that was also a spectacular road (not suitable for anything else but a dirt bike though). I crossed the lake on a man-made raft but the road doesn’t really exist as such and is instead a orange dirt track. Great fun, but certainly not recommended for scooters / Honda Win/Detechs. Great piece again! Keep up the great work! 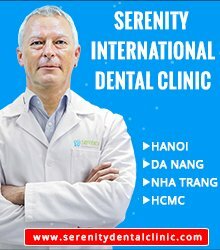 Hello, I’m a big fan of VietnamCoracle and I’m preparing for a trip around this region. Following up on this thread, I’m planning to use a 220-kilo, 900-cc Triumph Street Scrambler which I’ve been using on paved roads up to now. This bike is supposed to be made to go on rough terrain, but do you think the weight makes it too dangerous for these roads? I would think it will be fine as long as it can handle very steep ascents and muddy, off-road patches, although of course the problem with those heavy bikes in remote areas such as this is that if you get stuck beneath it there’s no one there to help you. Also, it’s good to remember that some of the roads are quite narrow. I’m going up there on Monday, I’ll follow your guide as well as the comments and post an update if anything new comes to light.